When the iPhone 4S first launched, AT&T ominously noted (through a document leaked to The Verge) that it was "working with Apple" to update the 3G indicator to 4G in the status bar. Back then, the extent of just how much AT&T was working with Apple on a regular basis to both build carrier.ipcc bundles and beyond was unknown, but the two have worked together in the past to make UI related changes, going all the way back to the iPhone 3G's signal to bars mapping. In addition, obviously the carrier works with Apple to both validate baseband behavior and respective updates. However, having the carrier dictate changes to UI seemed like new territory. With respect to the iPhone 4S there was also some confusion about whether the device was HSPA+, and whether that met ITU-R's earlier 4G definitions. All of that we addressed in another post that I'd encourage you to take a look at as a primer for all this. I'm not going to go into that whole debate again since honestly the "4G" thing boils down to a matter of definition, and whether or not you subscribe to ITU-R or not is a matter of principle. The iPhone 4S launched with a 3G indicator on iOS 5.0, and later was updated to iOS 5.0.1 with the indicator unchanged. Even up through the iOS 5.1 betas, there was no sign that AT&T had worked with Apple to do anything more than slightly bump up the ATT_US.ipcc carrier bundle version. Today with iOS 5.1 going final, things have changed, and the 3G logo of the past now has been updated, and is sure to confuse at least some people about what really has indeed changed. Now that we're out of the chaos of both an iPad and Apple TV launch, I think it's worth it to examine what the state of things are regarding the indicators and 3G toggles since there's still some confusion abounding. First up is this table, which I've updated with what we've been told or know about the newly announced 4G-enabled iPad. Obviously the cellular basebands and supported HSDPA/HSUPA categories haven't changed for the existing older iDevices, and the point is that this ultimately should govern your expectations for cellular speeds - not indicators. While it's entirely possible for baseband software updates to indeed introduce new features and even bump them up a category or two (like what LG did with the LG Optimus 3D), but none of that has happened here in Apple-land. Carrier marketing aside, nothing has changed regarding the iPhone 4S. After updating an iPhone 3GS, 4, and 4S with the iOS 5.1 release, and based on what I've learned from other users abroad, I've also checked and built the following chart out which shows the current 3G/4G indicator and toggle matrix. WCDMA/EVDO Indicator "3G" "3G" "3G" "3G" "4G" "3G"
Earlier in the day I saw and repeated reports that the iPhone 4 indicator logo showed "4G" on AT&T while charging and updating mine. Those turned out to be false, and I apologize for furthering that information. The iPhone 4 continues to reflect the same icon and toggle as before. The CDMA2000 1x/EVDO devices still don't have a 3G toggle since it still doesn't make much sense (those devices poll 1x from EVDO based on a slotted cycle, and both 1x and EVDO carriers are both 1.25 MHz wide) except unless you just want slower 1xRTT data on a whim. iPhone 4S users not on AT&T however do get a 3G toggle with the new iOS 5.1 update, and still show the 3G icon. Unlocked iPhone 4S with iOS 5.1 with T-Mobile SIM (left) showing 3G toggle, no 3G toggle with AT&T SIM inserted (right). The toggle is present on iOS 5.1, just not for AT&T subscribers. I picked up an unlocked iPhone 4S a while back so I could experiment with using the device on T-Mobile, and when I pop the AT&T SIM out and the T-Mobile SIM in, the 3G toggle re-appears as shown above. This backs up the feedback I've gotten from international users who report also seeing the 3G toggle on iOS 5.1. It should be clear at this point that AT&T's work with Apple went as far as both getting the indicator changed to match its HSPA+ as 4G marketing, and having the 3G toggle selectively remove itself when on AT&T. This lines up with AT&T's recent efforts to get as many devices as possible off of GSM/EDGE and onto the more spectrally efficient WCDMA wherever possible. AT&T has noted pretty recently that it will begin turning off GSM/EDGE carriers on its PCS 1900 MHz holdings as well. It makes sense to differentiate the devices from each other based on the considerable increase in HSDPA category and realizable downstream speed from each hardware iteration. I routinely am able to hit over 7 Mbps (like the test shown above which I just ran) and even above 9 or 10 Mbps from time to time on the iPhone 4S, speeds which are obviously not possible on the 4 or 3GS/3G baseband. It goes without saying that such differences in realizable speed deserve some differentiation, either in status indicator or elsewhere. At the same time, it seems like a very strange move for Apple to update the indicator on the 4S like this exclusively on AT&T so long after the device launched, and it's this change which has users up in arms online. From what testing I've done so far, the 4G indicator doesn't appear to differentiate HSPA+ 14.4 from HSDPA 7.2 at all on AT&T, it seems as though if you're on HSPA you're given the 4G indicator regardless. The obvious solution I would champion for is treating the end user like an adult and showing detailed information about the current air interface somewhere under about. On a more positive note, the 3G disconnect bug which previously affected the 4S running the iOS 5.1 betas seems entirely fixed. I haven't encountered that behavior at all since the update. 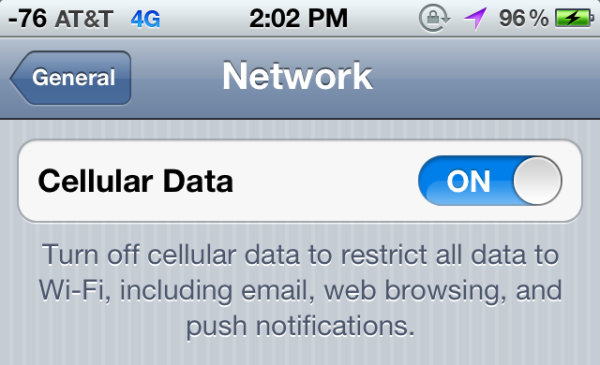 Why should Apple care about the semantics of the 3G/4G nomenclature that the wireless carriers screw around with. After all Apple wanted to supplant the carriers with WiFi everywhere, but I am sure that ATT and Verizon intervened in some fashion. ATT and Verizon are such cash whores that provide horrible customer service experiences. But since they have a duopoly on the market, they can do whatever they want. Imagine if you were driving down the road and the suddenly miles of the surface vanished for minutes at a time. Surely you wouldn't pay to use those roads, let alone drive on them. But in this case, what choice do we have?? In THIS case, the government SHOULD have the infrastructure in place for competition to come from any company wanting to start up a wireless service provider. Instead, we have 2. Both charging the same price. Both raising rates and taking service away. The only competitor offering a different choice is on the verge of bankruptcy. Thanks for the article, Brian, but I'm a little confused. The iPhone 4S doesn't have HSPA+ (which is an acceptable definition for '4G' by the ITU) but it will display '4G' when it's using a certain HSDPA Category 10, but on AT&T's network? Personally, I don't mind it too much. It's nice to have some indication that I'm in an area with a faster connection. I can't really disagree though that "4G" may not be the best term for it. Although, I would hope that they would also differentiate between HSPA+ and LTE. It would be a bit of a bummer to see "4G" listed for anything that they don't deem 3G. Nevermind how disingenous it is or isn't to display the 4G indicator like this, removing the 3G toggle actually has far more of an impact on the user anyway (potentially)... But how in the heck are they gonna market the eventual LTE version when they've been swearing up and down that nearly every phone they sell right now is 4G capable? Should we brace ourselves for a 4G+ ad campaign? Are they just gonna plaster LTE everywhere and expect the average consumer to know that it's somehow better than the "4G" they already have? The salesman made a statement that caught my ear.... "this SGII will be much faster because of LTE, unlike my Droid2 which is 'just' 3G "
I'm in the Seattle area... there is NO ATT LTE at this time. It'll be late spring if we're lucky...even then, likely not a whole area rollout overnight. Other salesmen were pushing to other customers how fast their LTE is, and absolutely pretended that LTE is here NOW. Heh, they've actually rolled out LTE already here in Puerto Rico and I'm resisting the temptation to switch back, hoping against hope that it doesn't take Sprint or T-Mo 2-3 years to find their way to LTE here (no VZW on the island). It shows LTE when you're on LTE.